I live just outside of Borough Park, which is probably the most diverse Chareidi neighborhood in America, if not the entire Diaspora. Boro Park is a bit more of a mixture than the other large "Frum" areas like Crown Heights (virtually entirely made up of Lubavitchers) or Williamsburg (mostly Rumanian / Hungarian Chassidim, such as Satmar and those ideologically close to Satmar) or Flatbush (more Litvish / Yeshivish). 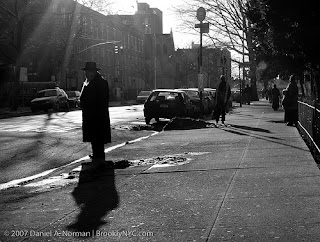 Probably due to space limitations and property values as much as anything else, demographics do shift over time and neighborhood identities can change somewhat, but for the most part Boro Park has a little of every type of what is called "right-wing orthodox." Sort of in-between Boro Park and Flatbush there is a buffer, a neighborhood called "Kensington," where I live. Here the demographics are quite a bit different, and it's sort of an odd mix: There are Yidden that want to be close to Boro Park; Yidden that want to be close to Flatbush; and Yidden that don't like Boro Park or Flatbush, so they chose to live here. Aside from all of these Yidden, we have a large number of non-Jewish neighbors as well – all kinds really – and among them there are a significant and growing number of Moslems. Mostly it seems they are Pakistani, but I have been told that a mere 4 blocks from where I live was the home of one of the September 11th hijackers, and a mere couple blocks south, I have been told, an Islamic shopkeeper was arrested who ran some kind of network supporting/fund-raising for Al-Qaeda. It is possible that these are unfounded rumors, and I've never attempted to confirm them, but among the residents here there are surely individuals harboring all sorts of ideas and affiliations, from the finest to the very worst. I don't hear of much friction – there is an occasional story that makes the rounds of a rock thrown at a Jewish school bus, or other occasional incidents like that, but overall I am not aware of any real visible hostility. I pass a couple mosques everyday, and I pass Moslems all the time; they seem to tend to be not that different from Jews in their desire to live quietly and keep to themselves. I often greet them as I walk, and so do they, but with the world situation, and the decades of tension in the Middle East, I am sure that we both share uncomfortable thoughts as we go about our business. Is it unsettling that a future, or past, terrorist may have passed me on my way to buy milk? Sure – Jews in Israel live this way constantly – but it becomes part of life, and you don't dwell on it. Is it frightening in some way? Sure, if you think about the negative and worst-case scenarios – but again, it's not productive and in truth no one is ever as safe (for a long list of reasons) as they think. We become complacent and secure, but nothing is ever guaranteed. "These are awesome and hidden matters…who knows why one individual soars like an eagle while another descends below into the realms of impurity, may G-d have mercy. Perhaps it is due to various sins or tests and obstacles that impact us and cause one to end up like this or like that – so certainly we must never judge another until we've stood in their place. Perhaps that individual stands in a place that one who is perfectly righteous could never stand, and had a more righteous man found himself in those circumstances he may have been far worse. Do not ask why G-d causes one be found amid impurity and obstacles, for perhaps G-d desires that this individual reveal G-dliness there amidst the klipos, while others who have not ended up in such a low place have merely been granted great mercy from Hashem who set them on another path. But one who imagines that their might and handiwork has achieved all they have accomplished in Torah, avoda and performance of Mitzvos – he is "soneh Yisroel" (hateful), and is literally without G-d. This is certainly so, and such an individual is lower and worse than all sinners and he adds strength to the forces of evil even more than all the wicked as he descends lower and lower…for he maintains that it is not from G-d, and believes that he did it on his own..."
He goes on, but you get the point. It's a huge world; each of us could have ended up literally anywhere, or nowhere. How am I different from the world's most wicked people? I differ only in that G-d in his mercy made me who I am. Those who focus on the negative see only negative, but if we believe that our existence is entirely by the grace of G-d, how can we be taken by fear and negativity? This is truly a beautiful post, thank you for that! It seems to me one of the greatest mysteries is why we are specifically who we are and not somebody else. Maybe only G-d can reveal the answer to us by granting us Daat. One of the most beautiful and lucid things I've read in a long time. Thank you, this truly has the ring of real truth to it. As one Kensington resident to another: Thank You! what about jews living in eretz yisrael? they have bloodthirsty enemies all around them, and yet they also have the great benefit of living in the holy land. you write from cozy golus so your words don't have a real ring for me. i guess i just have a different life experience. no disrespect intended.